The role of ICT is to be deeply embedded in the teaching and learning process to unlock its many potential uses. Creating powerful presentations and websites are now a common reality for both teachers and students, therefore school protocols and teaching expectations must change to reflect these needs. Thus as a matter of policy, schools should teach both students and teachers alike, as should universities teach those students studying to become teachers, how to operate in a legal manner when using the internet. The Year 7 and 8 band requires that when students communicate and collaborate online, that they develop an understanding of how to meet legal obligations. Can you confidently and quickly use images, text, videos and other web-based content legally in your work? The answer should be a resounding, "YES", if you follow the guides contained below. 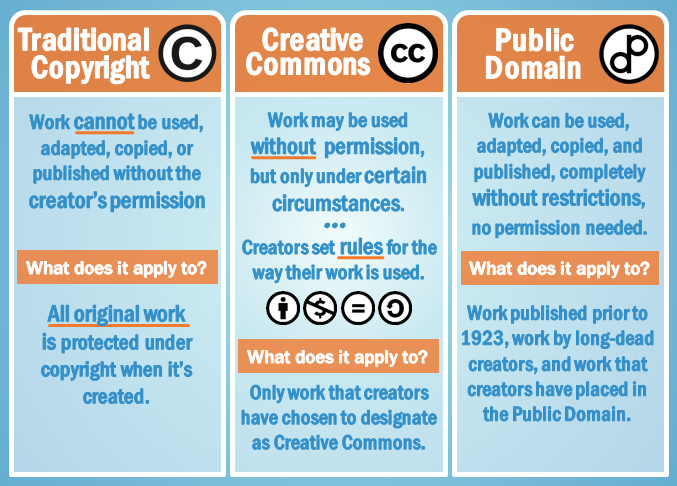 The following page will be presented in the form of learning objectives and success criteria so that any reader, student or teacher, can learn in simple steps how to respect copyright and creative commons laws. Learning Objective 1: To learn how to legally use images, text and other content created by another person. Remember the old adage, 'You can only use 10% of the book'? Does this still apply? Take down notes whilst watching this wonderfully creative ten minute video (created by Professor Eric Faden of Bucknell University, under a Creative Commons Attribution-Non-Commercial-Share Alike 3.0 License) about fair(y) use. (iii) Commercial impact: This video would not impact on the sales or viewing of Disney films. Scroll down to the bottom of the website/blog and look for the restrictions placed on the use of the content. Image © GCFLearnFree.org - Published with the written permission of GCFLearnFree.org under the conditions that (i) the image must not be altered, (ii) GCFLearnFree.org must be acknowledged as the owner and copyright holder of the image, (iii) a link must be provided to their website, and (iv) once the image was placed on this website, that the link be sent to them for their records. 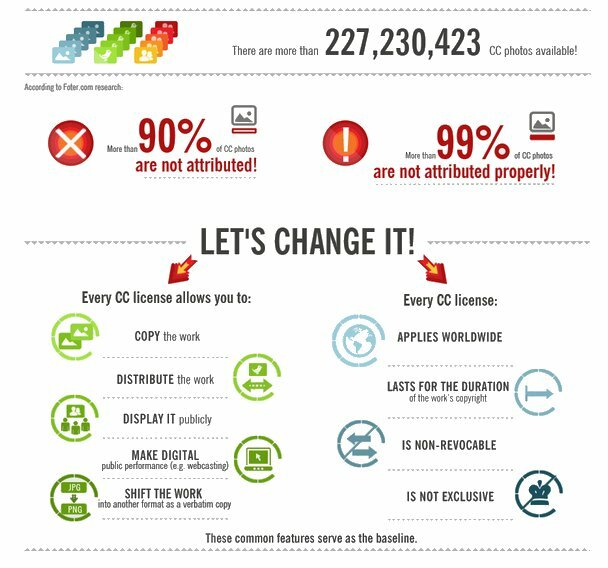 Read each section below to learn more about how traditional copyright, creative commons and the public domain can impact on the use of online content. Many websites protect their content using the copyright symbol: i.e. '© Australian Museum' or '© All Rights Reserved'. Yet this does not always mean that the content cannot be used! Upon finding a copyright symbol, one must either then look for a hyperlink contained within the copyright statement or for a separate link like "Copyright Information" to read the copyright conditions placed upon the content. Learning Objective 2: To be able to browse a website and determine the copyright conditions. Visit the following page on the Australian Museum website and try for yourself to find the copyright restrictions placed upon the images contained on the website. You should have found the stipulation by the Australian Museum that any image being used for personal, in-house or non-commercial use should include '© Australian Museum'. See the image used to the right with the copyright rules adhered to. Sometimes creators actually want their work freely shared, built upon or re-used, particularly by as many people as possible. Creative commons is a free license, without a signing up process, that allows creators who find normal copyright procedures too restrictive, to be able to share their work without giving up their copyright. Watch this easily to understand video created by Creative Commons Aotearoa New Zealand with support from InternetNZ, under the following license. 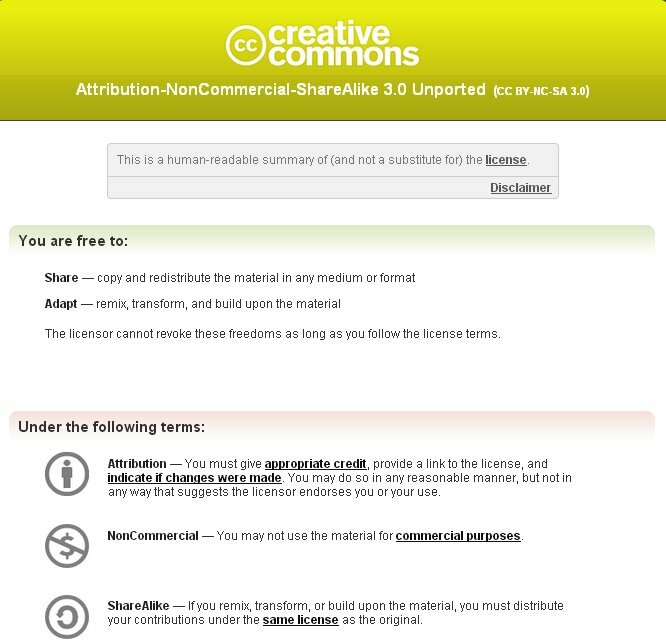 A creative commons license can be created in a matter of seconds and allows users to refine various easily identifiable self-defined conditions, upon which their work can be shared. or is made available in the public domain. 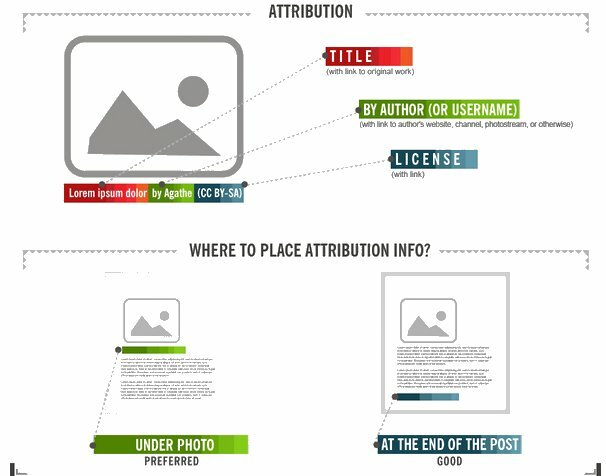 To determine if the work is shared under Creative Commons, one must search for statements such as CC BY-SA 3.0, CC BY-SA 2.0 or CC BY-NC-ND 3.0 or images such as the one on the right. Once one has determined that the work is protected by Creative Commons license, by clicking on the image or the text (e.g. CC BY-NC-SA-SA 3.0) the license and the restrictions placed on those who wish to use the work should appear (see an example of a CC license below) and must be met. 3. To be able to browse a website and determine the Creative Commons license conditions. 4. To be able to use an image from a website to adhere to a Creative Commons license. 5. To be able to use text from a website to adhere to a Creative Commons license. b) Copy an image from each website and paste it into any relevant presentation or document, class blog or personal website. We all know that Google Images makes accessing hundreds of pictures for whatever the heart desires, instant and easy. Yet do people actually read the conditions for use after clicking on an image? Ever noticed the 'Images may be subject to copyright' warning? When wanting to find images that are copyright free or available for use under creative commons licensing, it can be quicker and easier to use the methods outlined below. Learning Objective 6: To be able to use a search engine to find a royalty free image and use the image, adhering to any stated copyright or creative commons licenses. 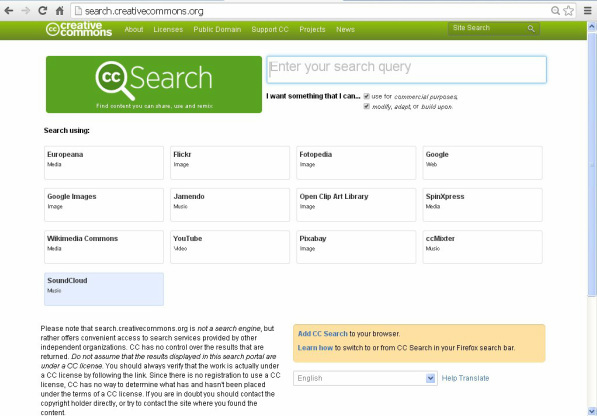 Creative Commons Search (http://search.creativecommons.org/) allows users to quickly choose from a variety of popular image search engines and other well-known websites for images, audio and videos shared freely under creative commons licensing. Simply enter your search query and click on one of the search providers! Students and teachers should untick 'use for commercial purposes' and 'modify, adapt or build upon' if they are wanting to simply find an image and use it in its original form for a non-commercial purpose. People using FireFox can even add CCSearch to the search bar. As per their warning contained at the bottom of their search page (see above), this search still does not guarantee that the image(s) found will be royalty free. Users must still search the website containing the image and read the copyright or creative commons license conditions that apply. Creative Commons Search allows you to select Flickr as a search provider. Flickr is full of wonderful photos by takes by both individuals and various organisations. To search Flickr, click on the Flickr button, type in the search bar what you are looking for and then press Enter. To locate the copyright restrictions placed on Flickr photos, click on the (i) then click on the copyright symbol © to access the required conditions. Whilst Creative Commons Search already contains a Google Search option, should you wish to know how to turn on a creative commons search within Google Images, simply look to the top right-hand side of the screen for the Settings cog (underneath the 'Sign in' button) and click on 'Advanced search'. Then scroll down until you find the blue text, 'usage rights'. Now you can select the various filters you wish to search using. Note: This does not guarantee that the image(s) found will be royalty free. Users must still search the website containing the image and read the copyright or creative commons license conditions that apply. Activity: Use any of the above search methods to locate and use a royalty free image and state the relevant copyright/creative commons license. Learning Objective 7: To be able to use an online service to find music that I can freely use for projects. Use the following online services to locate music that can be used freely given the correct circumstances. Ensure that you read their copyright policy and make the relevant citations. Public Domain 4U: A great site for finding public domain music downloads. A lot of the music is old (music from the early 1900s is now in the public domain if copyright was never renewed), but there is also more modern music that is free with artist permission. ﻿Musopen﻿: Provides music that has the copyright expired, browsable by composer, performer, instrument, period or form. ﻿ccMixter﻿: A music site containing music that falls under the Creative Commons license. The site lets users listen to music, sample music, create mashups and more. Just keep in mind that some creative commons licenses may require that users to give credit to the source within your video. Moby Gratis: Famous musician Moby provides over 150 of his tracks for independent and non-profit filmmakers, film students, and anyone in need of free music for their independent, non-profit film, video, or short. Incompetech: A composer Kevin MacLeod and has lots of royalty-free music, categorized by genre. FreeSoundtrackMusic.com provides both paid and royalty-free tracks for use in films, YouTube videos, games or other multimedia productions. Audio Network: Audio Network is a service that is only available to students and schools in the United Kingdom. Audio Network provides music by artists who have agreed to allow students to be able to use the music for free but only for school work provided that the work is not distributed or 'shared' outside of the school or online. The music is not for use in non-educational or commercial activities. Learning Objective 8: To be able to use YouTube Editor to creative commons video and audio and use these to create an information report in the form of a self-narrated video. Quite regularly, students choose to present their projects or information reports in the form of posters, websites or blogs. However, all it takes is just one look at these wonderful information report videos (The Legendary Lizard & The Sensational Snake) from Brandon Gifford (Casino High School, NSW), winner of the 2011 & 2012 ABC Sleek Geeks Eureka Prizes, to convince a class to embrace creating a narrated video for their projects instead. However, without following the above mentioned ideas (and the YouTube guide that is to follow), the videos that students wish to narrate over the top of, would on most occasions, break copyright law. After creating a Google Account users can access YouTube Editor. From YouTube Editor, with a little bit of searching (and using the screen dumps below), users can access a searchable list of licensed videos and an audio library. There are also a variety websites that provide royalty-free, non-watermarked, non-transferable images for people to use. Check out StockXchng to see if their online catalog contains your desired image and read their copyright legal information. Success Criteria 1: I have learned how to legally use images, text and other content created by another person. Success Criteria 2: I can browse a website and determine the copyright conditions. Success Criteria 3: I can browse a website and determine the creative commons license conditions. Success Criteria 4: I can use an image from a website and adhere to a creative commons license. Success Criteria 5: I can use text from a website and adhere to a creative commons license. Success Criteria 6: I can use a search engine to find a royalty free image and use the image, adhering to any stated copyright or creative commons licenses. Success Criteria 7: I can use an online service to find music that I can freely use for projects. Success Criteria 8: I can use YouTube Editor to creative commons video and audio and use these to create an information report in the form of a self-narrated video.